It is the story that clean energy enthusiasts have been waiting a long time for, the opening of the Concentrated Solar Power (CSP) plant Noor 1. It will be the largest solar plant in the world and it is located at the gate of the Sahara Desert, in the area of Ouarzazate, Morocco. Clean energy enthusiasts are keen to tap the plentiful solar energy, largely untapped, of the Saharan desert. It’s been a long-running project, originally started under the German consortium Desertec. But disagreement about its direction meant that the consortium was broken up, and the future of the project, called Noor, was put in the balance. Instead, it is now being partly funded by MASEN, which is the Moroccan agency for solar power, established by the government in 2010. The Noor project will be installed in three phases, and the first phase inaugurated earlier this month has the capacity to deliver 160 megawatts of clean energy. By 2018, when all three phases are in operation, Noor 1 will have a total generating capacity of 500 megawatts (MW). It will deliver clean energy to one million Moroccans, and will prevent 560,000 tons of carbon emissions a year. The technology used in solar thermal power plants is different from its more famous cousin, the solar PV technology. Solar thermal plants use parabolic troughs to focus the sun’s energy on to heating a fluid which then, in turn, powers a turbine generator. Therefore, unlike a solar PV farm, which stops generating electricity after sunset, solar thermal can provide electricity for 24 hours a day. Morocco has an aggressive renewable energy policy. Their aim is to generate over half of their electricity needs from renewable sources by 2030. This is in part to make up for the fact that it is the only North African country without any fossil fuel reserves, and why they have had to import 90% of their energy. 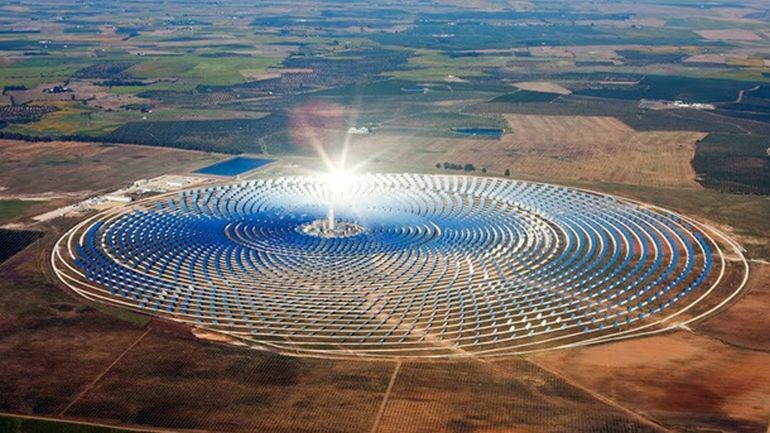 In total, the Moroccan government has an ambitious target of 2 GW of clean energy coming from CSP plants around 2020. The first phase of Noor 1 is estimated to have cost $894 million. But in total when all the current CSP Noor plants are complete, it is estimated that the cost will have risen to around $9 billion. The projects, apart from MASEN, are being funded by the French Development Agency, the European Investment Bank, Germany’s KfW, the World Bank, the Clean Technology Fund, the African Development Bank, the European Union, and Germany’s Ministry of Environment. Last month I wrote that investment in renewables in Morocco went from nearly $0 in 2014 to $2bn in 2015, with the Noor project and a wind farm being the main contributors to the acceleration of clean energy financing. While the priority is to provide clean energy to Moroccans, it is anticipated that in the future some of the energy could be exported to energy-hungry Europeans. Initially, that was also the main motivation of the DESERTEC German consortium.